Look for the question mark within the circle on the top-bar and click it to bring down the “Privacy Shortcuts” menu. Notice that Facebook now provides quick access to three of the most important settings here, but for now, we’re going to visit See More Settings. Most of you have seen this and made changes in the past so for this reason we are going to explore each area and show you the specifics of this section. 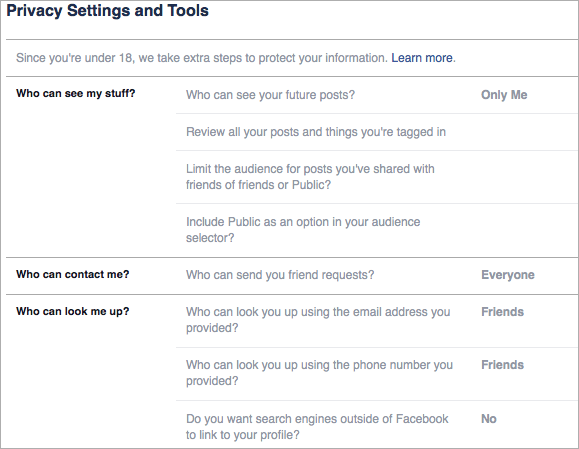 In “Privacy Settings and Tools,” Facebook provides you with options for controlling who can see your stuff, contact you and look you up. 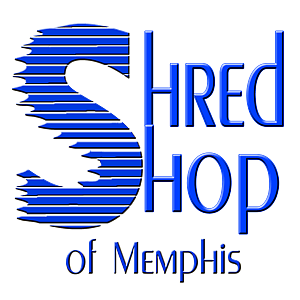 Here, you can peruse a past account of all the content you’ve been involved with. In some cases, you may have been tagged in a post – showing how your digital footprint isn’t always under your control! We’ll come back to the Activity Log in the next section. Limit The Audience for Old Posts on Your Timeline, also has a particularly sweeping effect. Clicking “Limit Old Posts” will change the audience of anything you’ve shared with Friends of Friends or the Public to Friends only. “Include Public as an option in your audience selector?” is a one-time choice – enabling this option will add “Public” to your list of audiences. In my experience, once you’ve switched this on, it can’t be turned back off. In terms of “who can send you friend requests”, choose Friends of Friends if you’re concerned about unknown invitations or solicitations. Otherwise, stick with Everyone. The next two settings apply to people who can’t already view your email address and phone number, respectively. 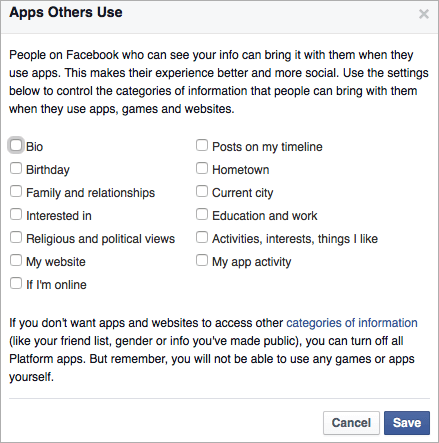 Ideally, set both of these “who can look you up” options to Friends to prevent data leakage. The final – and rather important – option in this section, involves having your Facebook profile indexed by search engines. Unless your profile is well-known in the public eye, be ensured this setting is disabled. We’re now going to take a look at settings specifically related to friends’ interactions with your Timeline, so click “Timeline and Tagging” in the sidebar. This section involves the media and posts that other people link you to, rather than the content you create yourself. 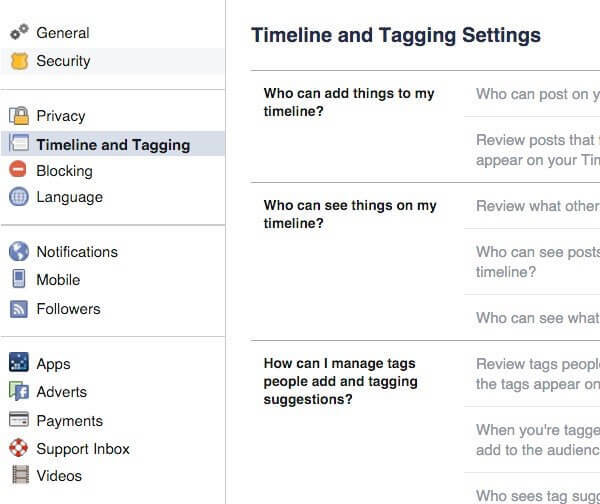 Notice the first setting – “Who can add things to my timeline?” – this gives you the ability to control whether anyone else can post on your Timeline at all. 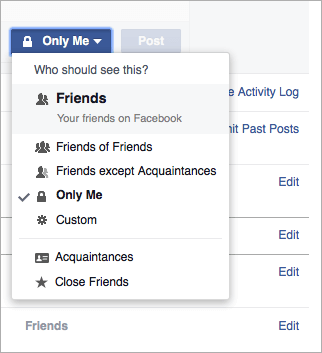 Select Only Me if you wish to prevent Friends from posting on the feed. The next option is “Who can see things on my timeline?”, which offers a link entitled “View As”. This helpful feature lets you see what your Timeline looks like to the public or a particular friend. 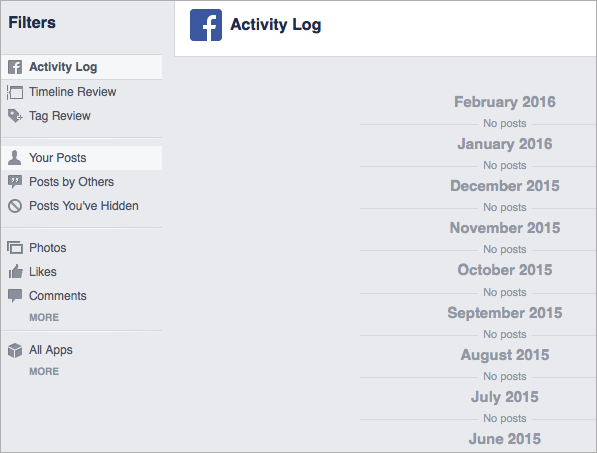 Upon clicking on View As, you’ll be presented with a Public view of the profile. If you’re interested in seeing what a particular person views when they visit your profile, type their name into the selector. Moving on, the next two options give you access to a more granular – or specific – range of audience selectors. “Who can see posts you’ve been tagged in on your timeline?” and “Who can see what others post on your timeline?” speak for themselves: these options let you control which groups can view mutual content. If you’re concerned about strangers or acquaintances viewing these posts, consider opting for Friends except Acquaintances or Only Me for maximum privacy. The next sub-section talks about “managing tags” and “tagging suggestions.” In clearer terms, we’re talking about the “Kate tagged you in an album” or “Michael tagged you in a post” notifications here. 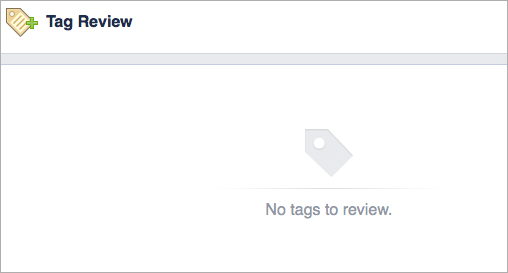 We recommend ensuring the Tag Review feature is set to enabled – which is where Activity Log returns to the spotlight. Within the Activity Log is the home of Tag Review itself; here you’ll be presented with any content that friends have tagged you in. You’ll have the option to approve or reject these posts individually. “When you’re tagged in a post, who do you want to add to the audience if they aren’t already in it?” is a rather cryptic, standalone option. Imagine you’re tagged in an old school friend’s status update, but some of your friends don’t know them on Facebook. Setting this option to Friends, or another audience, allows you to share these posts with additional groups. 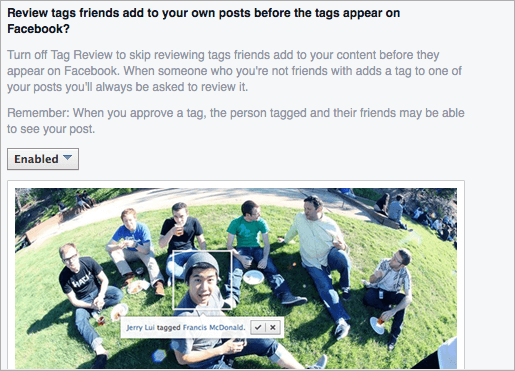 If you leave this option enabled, Facebook will use your face and account in other people’s suggested tags. You may be in a situation where blocking a person is the most appropriate option. If you’re interested, look for the Blocking option on the sidebar. Instead of a “full block,” you can also choose to just block messages, app invites or event invites from particular friends. 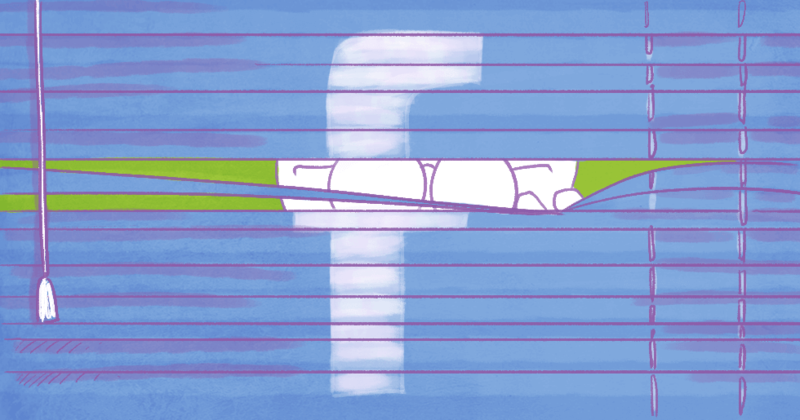 Games and apps are hailed as a deeply integrated part of the Facebook Platform – but they are unnecessary annoyances on the social network. You’ll see what I mean in just a second. Look for the first heading, “Apps, Websites and Plugins”, and click Edit. 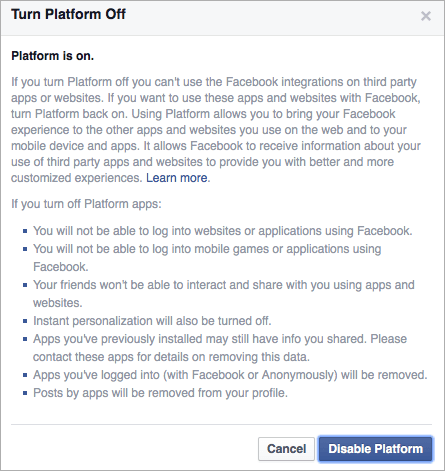 I’d strongly advise clicking Disable Platform unless you’ve got a particular need for these features. Next, look for the “Apps Others Use” heading and click Edit. This feature claims to make your Facebook experience “better and more social” It’s entirely up to you but we recommend that you un-tick every checkbox. Taking the above steps will help make your Facebook experience safer and more private, but don’t forget that history has shown that the social network has a habit of rolling-out changes to its privacy settings and introducing new features which may make you less protected online. Make sure to keep informed of the latest changes, and review your privacy settings regularly.